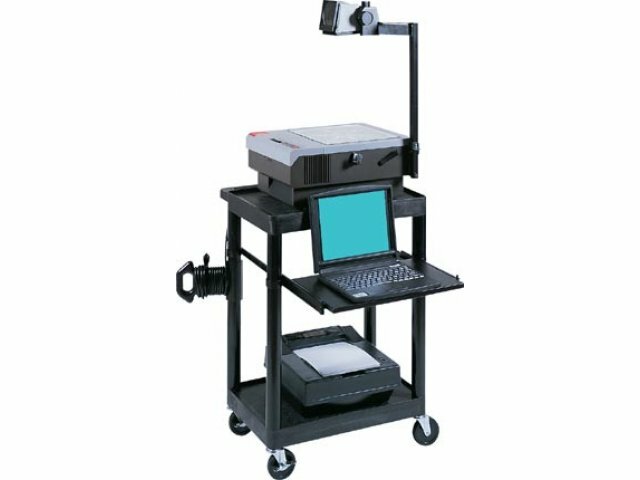 These Mobile Presentation Carts provide all-in-one storage for your AV and computer presentation equipment! 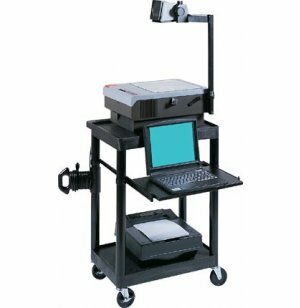 They can be used as a sit-down workstation or with a notebook and overhead projector for presentations. Safety handle molded into top shelf. 3-outlet, 15 ft. surge suppressor. Cord management helps avoid cable clutter. 4" casters, 2 locking, ensure mobility or secure placement as needed. Molded shelves and legs will not stain, scratch, dent or rust. Retaining lip and sure-grip safety pads keep equipment securely in place.